This is an interesting Recipe of the Month as you may or may not get the opportunity to make these, but I hope to introduce you to trying something different and delicious, if you ever see them at a Vietnamese restaurant or travel to Vietnam. Bo Lá Lốt are one of my all time favourite grilled starters when we visit Vietnam, The lá lốt (wild betel leaves*) availability is limited, especially in Perth, I found some at a small local Asian grocer a few weeks ago and jumped at purchasing them so that I could prepare these for the family. The grocer told me that they are usually available around the warmer summer months. Please don’t hesitate in contacting us if you’d like to know where I sourced mine from. 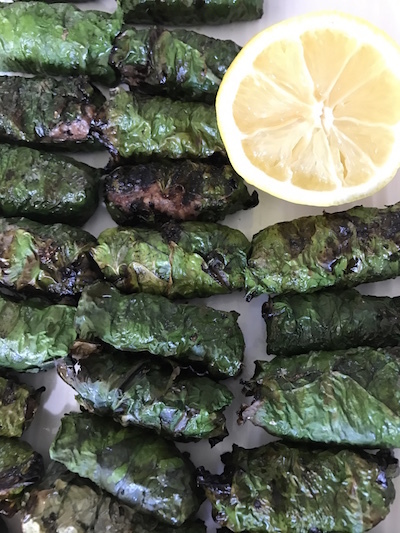 Some recipes suggest that you can substitute grapevine leaves for the wild betel leaf , but they lack the sweetly spicy fragrance that the la lot leaves impart once they are grilled over an open flame. Look for shiny bright green leaves, and even if they have a few holes in them, that is fine. 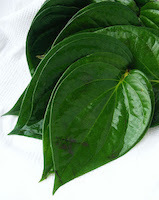 *Lá Lốt (Wild Betel Leaves) is a native plant to Vietnam and Thailand, and is related to black pepper. It is sometimes called “betel leaves”. It should not be confused with Piper Betel, the leaves of which are chewed with “betel nut” ( the seed of a palm) and lime as a stimulant in parts of South East Asia and Papua New Guinea. In a mortar & pestle, combine the chopped lemongrass, coriander roots, shallots and garlic into a paste (or simply finely chop all of the ingredients). Combine with salt, pepper, sugar and five spice powder. 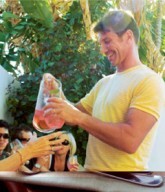 Let flavours develop for about 15 minutes. To form the rolls, place the lá lốt leaves, shiny side down, onto a clean work surface. Form about 1- 1 ½ tbsp of the mince mixture into little sausages, about the size of your little finger, and place it along the wide bottom edge of the leaf. You can use 2 smaller leaves if necessary. Roll the leaf from the bottom to the top, folding in the edges once you start rolling, if possible. Place seam side down on a tray to prevent from unrolling. To cook, brush with a little oil and place seam side down on a preheated chargrill at medium/high heat. Cook for about 8 minutes, turning them often to cook evenly and to prevent the leaves from charring too much. The cooked rolls will feel firm, look a bit shriveled, and be slightly charred at the edges. Serve with Salt/Pepper/Lime Dipping Sauce. Place small individual bowls of the salt, pepper and lime on the table and provide each person with their own individual dipping bowl. They can then combine about 2 parts of salt, one part of pepper and a squeeze of lime into each of their individal bowls to dip with their Bo La Lot. Alternatively, combine in one little bowl in the same ratios and let everyone dip from the same bowl.